To give sleepless nights to it’s rivals, Motorola soon going to launch it’s 4G LTE budget smartphone, Motorola Moto E(Gen 2) with 4.5”-inch qHD display, Android 5.0 Lollipop, Snapdragon 400 processor, Dual-5-MP Camera in Indian market. If rumours come true Motorola Moto E(Gen 2) will launch in Q1 2015 priced under Rs 5,000.It will kill Micromax, Xolo, Xiaomi and Samsung in budget phone market. According to leaked specifications, upcoming Motorola Moto E(Gen 2) will support 4G LTE , Dual-SIM(GSM+GSM), Wi-Fi, Bluetooth, USB, GPS and FM Radio will offers you a bigger 4.5-inch qHD (540×960 pixels) display with Corning Gorilla Glass 3 for amazing picture quality and video quality from every angle runs on latest Android 5.0 Lollipop OS and powered by 1.2GHz Snapdragon 400 processor with 1GB of RAM and 8-GB internal memory and 64GB expandable memory for superior multi-tasking and gaming. Moto E(Gen 2) will also sport a 5-MP Primary Camera with LED flash and 5-MP secondary camera expected to be packed with a 2900mAh battery with superior battery life. Bigger qHD Display with Corning Gorilla Glass 3 screen. 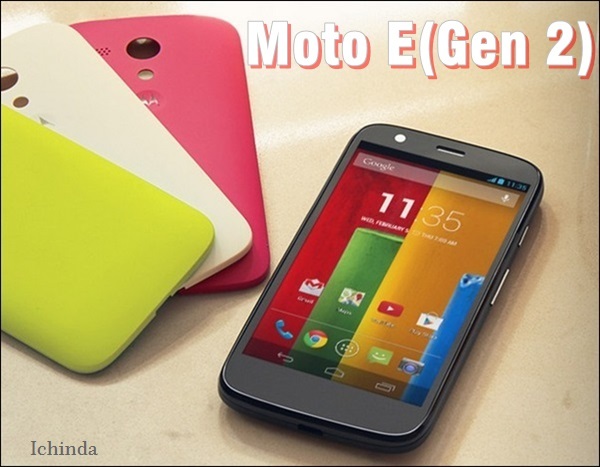 At last Few Honest word, upcoming Motorola Moto E(Gen 2) is coming to rule the budget phone market in India. What you think? Please be open to give your view.